Many older people may have had 'minor' strokes without even realizing it - for example - a stroke can occur whilst one is asleep - your client might wake up feeling numb or having lost facial muscle control for a short while - only to feel as fit as anyone else shortly afterwards. The good news is that because your brain has two hemispheres it is sometimes possible to use both hemispheres to enable your client to live an (almost) fully functioning lifestyle. 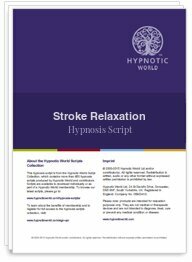 Download this Stroke Recovery Hypnosis script download to learn how to help your clients to live functionally again.